ICAI recently conducted CA IPCC November 2017 Examination. 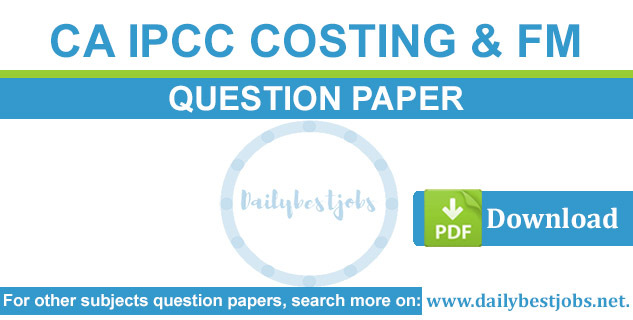 Here is Costing Question Paper for IPCC students to download & check it IPCC Cost & FM Question Paper Nov. 2017. So, from the below link, you can download this IPCC Costing FM Question Paper Nov 2017 for CAFM exam preparation. CA IPCC Cost Accounting & Financial Management Question Paper Nov 2017 in pdf is available to download from the below-provided link. We already added all other subjects IPCC November Question Papers 2017 here. You can direct download it or Subscribe now your email address to get the latest updates. Download PDF below of CA IPCC Cost Accounting & Financial Management November Question Paper 2017. You can also search latest practice manual, certified copies, ICAI question papers with solutions & important notes.